Never mind the White House. What many black people still long for is any house at all. That door to opportunity is home ownership — which, for most Americans, is their single most valuable asset. Yet more than half of African Americans don’t own homes. A recent report by the Institute for Policy Studies highlights that only 41 percent of black families are homeowners, compared to 71 percent of white families. White people don’t own homes at greater rates because they picked themselves up by their bootstraps while black people sat around. After the Great Depression, the federal government started subsidizing housing for white folks to help them get back on their feet. But if you weren’t white, you missed the boat. In fact, the report notes, just 2 percent of Federal Housing Administration loans went to non-white households in the years following World War II. Meanwhile, discriminatory housing practices have held African Americans back. Even when some blacks were beginning to successfully build wealth, it was taken away. Under President Franklin D. Roosevelt, “slum clearance” measures spread rapidly throughout the country, leading to widespread demolitions of black middle-class homes. In the name of expanding public housing, many black families literally lost the roof over their heads. More recently, subprime lending has emerged as the most dangerous attack on African-American homeowners. Thanks to predatory mortgage practices, black families lost three to four times as much wealth during the Great Recession as white families. To reverse these trends, we need to create a housing boom for low-income and first-time minority homeowners, invest in financial literacy and career readiness programs, and bring middle-class and high-wage jobs into newly developed black neighborhoods. “A society has a moral obligation to make a large, aggressive investment,” President Obama said recently, “in order to close those gaps” between black and white Americans. A truly “aggressive investment” would ensure not only equity for African Americans in this country, but would also expand middle-class America, reduce crime in America’s major cities, and improve schools in urban communities. 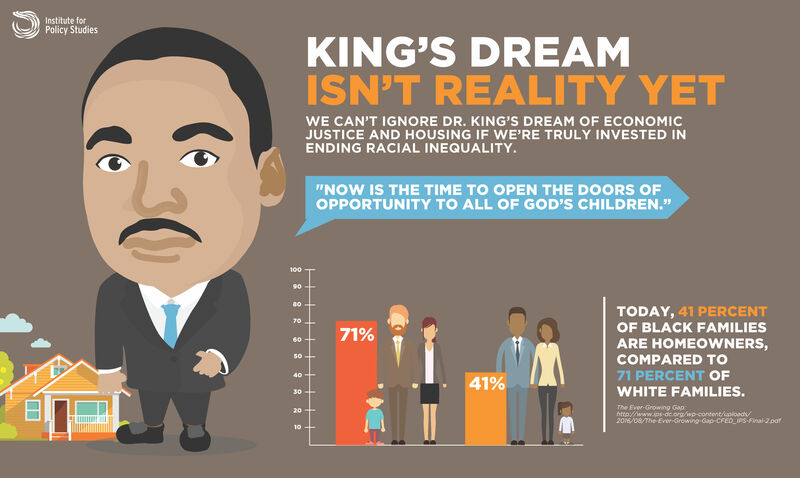 Without that, Dr. King’s dream is still deferred. The post King’s Dream Still Isn’t Reality appeared first on OtherWords. This piece was reprinted from Other Words by RINF Alternative News with permission.